Rose gold has a pink tint. This tint causes it to stand out from conventional yellow or white gold jewelry. The pinkish color comes from a combination of gold and other metal alloys. Typically copper is combined with the gold, as copper has a natural reddish brown color. Pure gold itself is too soft to be made into jewelry, so blending it with other metals adds strength and durability to the piece. In rose gold, the percentage of copper relative to gold is higher than normal. The typical blend is three parts gold to one part copper, or 75 percent gold and 25 percent copper. Jewelers can add as much copper as they would like to the gold. As a result, rose gold can come in a wide variety of hues and colors. The color will also be dependent on the carat rating of the gold. A gold ring, with a higher carat, will have a higher percentage of pure gold. This leaves less room for the copper alloy. Because of this, a ring with a higher carat of gold will generally appear to be less pink in color than rose gold rings with a lower carat. If a person wants the diamond in the engagement ring to match a rose, gold band, the individual may be better off going with pink diamonds, rather than the traditional white diamond. Rose gold is generally less expensive than normal white or yellow gold due to the fact that copper is less expensive than other alloys, like silver. However, rose gold engagement rings are extremely rare, which drives the price back up. Couples, generally, need to custom order rings in rose gold, or find an independent jeweler to order a piece that they will find interesteding. Rose gold is relatively rare. 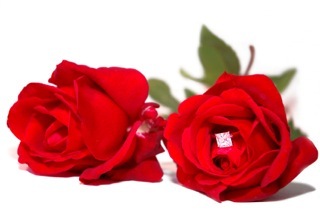 Independent jewelers are more likely to have unique rose, gold pieces than leading jewelry retailers. Many custom rings can be requested with rose gold. Designer rings are beginning to use unusual metals, more frequently. There are several different types of engagement rings that incorporate rose gold. Filigree engagement rings use it for accenting its delicate and intricate designs. Filigree rings have extensive metal work with symmetrical patterns. These patterns are popular with antique and vintage rings, as this type of metal work was a more popular art form before the invention of modern-jewelry making practices. Celtic engagement rings are also known to feature rose gold. It is typically woven into the knots and patterns that accompany this style of ring. It is also used to contrast with other metals. Doing so creates a unique ring, with multiple tones. The two toned rings are popular because contrasts in the different types of metals highlight the most minute of angles and intricate details of the craftsmanship. Mokume Gane engagement rings also have been known to include rose alloys within the ring design. The patterns and use of multiple metals give these engagement rings and wedding bands a unique and distinguished look. Patterns that infuse rose gold include the rivers pattern, which creates wavy stripes, and the islands pattern, which features loops. Many mokume gane designers also create rims on their rings, effectively framing and enhancing the pattern. Deborah Olague is a close friend of mine who has designed Mokume rings since 2003. She made our wedding bands & she also sells them to many other jewelry retailers who then add significant mark up for people who do not purchase direct from her. One of the easiest ways to track down rose gold jewelry pieces, including rings, is by searching online for antique jewelry. The Antique Jewelry Mall (www.antiquejewelrymall.com) features a variety of pieces made from rose gold. For example, a shopper could find an Art Deco antique style 1 carat filigree engagement ring mounting, which features a wheat pattern and diamond set flowers, for under $1,400. Other rings feature unique stones, such as the filigree scrolls, which contains a 1.5 carat rose red rhodolite garnet gemstone. This ring will run the buyer at about $820. Another Art Deco ring, with a 1/3 carat center diamond, can be purchased for under $1,500 on the same site. Another online retailer of rose gold wedding bands and rings is Jewel Basket, found at www.jewelbasket.com. This website offers a variety of options for both men’s and women’s wedding bands at a discounted price. The thicker bands, which are typically those that would be worn by a man, range in price from $360 to $500 on this site. These are all 14 karat rose gold. The thinner bands commonly worn by women are priced up to $350, but the lowest price is just under $140. There are several different jewelry designers that specialize in rose gold or add pieces made with it to their collections. The following designers all offer rose gold engagement rings and wedding bands for prospective brides and grooms to select. One popular designer of rose gold engagement rings is Tacori. This designer is known for fusing antique elegance with modern styles to create signature diamond engagement rings that are a work of art. Each ring is hand crafted in 18kt rose gold, and the mounting can fit up to a 1.5ct stone. The engagement ring band also contains .22cts of round diamonds, and a matching diamond wedding band can be purchased separately with .31cts of round diamonds. Prices of Tacori rose gold engagement rings range from over $1,000 for just the mounting to well over $5,000 depending on what size stone is used. Wedding bands for women usually run from $1,500-$2,000. Rose gold is considered a special order, though, and purchases are nonrefundable. Tacori engagement rings and wedding bands can be purchased on the Tacori website or at authorized jewelers, including JR Dunn. Simon G also designs wedding and engagement rings that incorporate rose gold. Simon G has been a trend setter when it comes to bridal jewelry for over 20 years, and his creations have been found in a variety of famous magazines and publications, including Elle, Cosmopolitan, Marie Claire, The Knot, and Brides. Some of his rings feature rose gold accents on 18kt white gold along with white or pink round diamonds, or both. Bijoux Extraordinaire, which is based out of Manchester, New Hampshire, has two engagement rings featuring rose gold, the Pink Fleur ring and the Pink Passion. The Pink Passion features a brilliant 1.3 carat oval diamond in the center with a row of Fancy Intense Pink diamonds on both sides. The pink diamonds are set in rose gold along the shoulders of the ring, and the edges of the rose gold are mill-grained to further show off the pink color of the diamonds. The Pink Fleur is similar to the Pink Passion, but it is on a bigger scale. The ring features a 2 carat oval diamond set in platinum, and it is situated in between six Fancy Intense Pink diamonds. The pink diamonds are set in rose gold channels, and there are also rose, gold accents and scrolls around the sides of the ring. This company creates designer jewelry including diamond rings in 14 karat rose gold. One of the unique designs is the lotus blossom. This particular design won an international design competition. It features a 1.2 carat center stone along with 211 gemstones. This beautiful ring is sold for just under $10,000. Other rings featured by this designer include an emerald cut diamond engagement ring, a princess cut, and many more. All the rose gold designs offered by the company can be found on their website, which is www.gemvara.com. Some leading online retailers also sell diamond engagement rings and settings with rose gold, such as MDC Diamonds New York. One setting that can be purchased, features Asscher cut diamonds with trapezoids in a vintage style engagement ring setting. The ring features two tones, white and rose gold. The rose gold frames the center stone, which can accommodate a stone of 1 carat or larger. The ring features round cut, pink sapphires. Many celebrities are beginning to sport the high-fashion look of rose gold or pink gold, engagement rings. Katie Holmes received a 5 carat round solitaire diamond engagement ring set in rose gold from Tom Cruise. Maria Carey’s engagement ring also features a rose gold band with three pink diamonds, and it is valued at $2.5 million. Because of this renewal in popularity, the demand for rose gold wedding jewelry is beginning to steadily increase. If a person is allergic to copper, discoloration or swelling of the finger may occur due to the copper alloy in the rose gold. Other than that, rose gold engagement rings and wedding bands require the same care as any other gold jewelry. It should be kept clean, removed when a person is using harsh or abrasive chemicals, and should avoid situations that could scratch, dent, or warp the metal. Gold does not tarnish like other metals but it can get dirty from lotions, makeup, and oils. Gold rings can easily be cleaned at home using a mild dish detergent.